Taking a photo of all of us together each month has become routine now. Even now that our family is forever incomplete, it is still important to me to take that monthly photo. I always carry a photo of Jessica in my rucksack so that we can include her in the photo if an opportunity presents itself while out and about. It’s important that she is still included, even though she is no longer physically here. The start of a new year is always a stark reminder of the passing of time. When I look back at photos of Sophie and Jessica from last year, it hits me just how much she has grown and changed in those months since losing her sister. How her place in the family has shifted so much in the last year – from little sister, to being on her own, to being the big sister. Thomas too has grown so much. He’s no longer my tiny baby; he’s now six months old, enjoying his first tastes of solids, starting to roll and interacting more and more with Sophie each day. In our family photos, Jessica will forever be frozen in time. The rest of us will change and grow older, but Jessica will stay forever six. The photo we use to include her may change, but the little girl in it will still be the same age. This month, I quickly grabbed the opportunity for a family photo one morning before school when we were making the most of the first snow of the year. 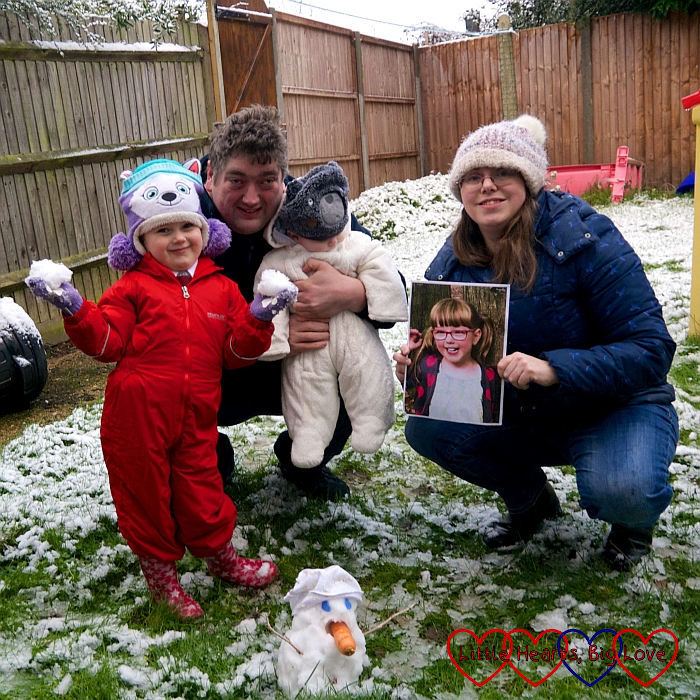 I couldn’t help remembering the last family photo we took in the snow – back in March last year. 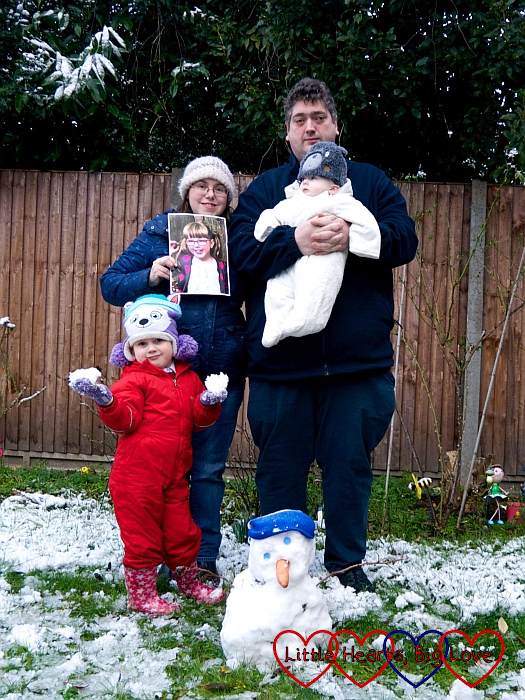 Hubby jokingly telling me off for trying to be “an Insta-Mummy” as I made them all pose next to the snowman we built. Snow brings very mixed feelings now. I love to see Sophie’s excitement but it makes me sad to see her playing in the snow by herself. We had a lot of snow last year. Jessica enjoyed it at first, but struggled with the cold. I remember that last snowfall in March last year. Jessica stood at the window and sighed. “Oh dear, it’s still winter. It’s never spring. When is it going to be spring, Mummy?” It breaks my heart that she never really got to see the spring. It finally arrived on the day she died. January has been a tough month. 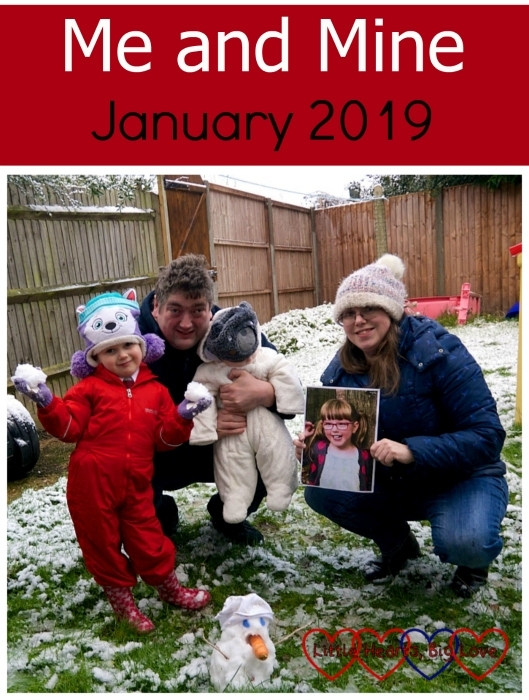 I knew that the start of a new year would be hard, especially with the memories of Jessica’s recovery from the Fontan and our excitement last January at announcing that we were expecting another baby. I hadn’t anticipated that the return to normal routines would hit so hard and that those early weeks of January would feel so very bleak. As always though, we just keep taking each moment as it comes. Holding on together. Trying to make happy memories as a family amongst the sadness where we can, and just holding each other close when the stormy waves hit.